Not even the argument that American football evolved from Harvard and the Boston Game holds up too well in court. The reality is that it grew out of rugby, and had the British dominion of Canada to thank. It’s not something they like to make a song and dance about in the United States. Rutgers and Princeton’s match in 1869 is said to be where it all started for American football, but how much was that really the case? That game, and the one standardised by the Intercollegiate Football Association in 1873, was basically soccer. But the Stateside penchant for off-the-ball physicality was already rearing its head. football, when instead they turned to a rugby-playing university from Canada for opposition. 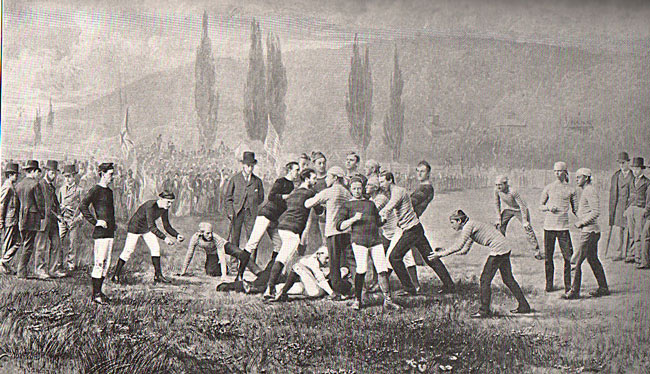 Posted on November 15, 2011, in Uncategorized and tagged harvard vs mggill 1874, henry grant, intercollegiate football association 1873, princeton vs rutgers 1859, rugby in america. Bookmark the permalink. Leave a comment. 1. A Whole New Ball Game: What is football? Get your copy of The Same Old Game!